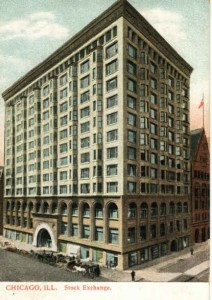 In the 1970’s the city of Chicago, like Milwaukee saw many buildings fall to the wrecking ball. In the spring of 1972 the Chicago Stock Exchange building was being demolished. This structure was a grand example of late 19th century architecture designed by the famous Chicago architects, Dunkmar Adler and Louis Sullivan. It was considered one of Sullivan’s best remaining works of architecture in the early 1970’s. It was an imaginative work that used the latest technology of the steel frame and merged it with the highest forms of decorative arts and terra-cotta. One person interested in documenting and trying to save the Stock Exchange and other 19th century Chicago buildings was Richard Nickel. He was an architectural photographer and historian who was continuing a project to completely document all of Adler and Sullivan’s remaining work. This started in the early 1950’s after studying under Aaron Siskind at IIT Institute of Design in Chicago. 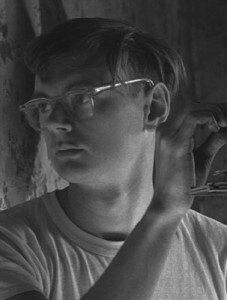 The project continued after he completed his thesis in 1957 and grew with the demolition of the Garrick Theater in 1961. Nickel launched an all-out preservation effort to try and save the Garrick early in 1960 and even with a court battle by preservationists was unable to halt the building’s demise. Luckily he was able to salvage many terra-cotta and plaster ornamentation as well as completely documenting much of the building prior to its destruction. The last battle that he fought was the effort to save the Chicago Stock Exchange. This crusade was fought for several years before it was found to be unwinnable. As with the Garrick, the only solution was to save as much of the building’s artwork as possible. Richard Nickel worked with the Art Institute as well as the Metropolitan Museum and Southern Illinois University to save various architectural artifacts for their collections. Through his effort, many artifacts were salvaged from the Stock Exchange building including an immense entrance arch which was placed outside the Art Institute in 1977. He continued on with his salvage work and documentation, often working alone whenever he had the opportunity. He sacrificed much to save a history that many didn’t think was worth saving and because of that we know much about Adler and Sullivan that would have otherwise been lost. The last day anyone saw him alive was 40 years ago today. He was found in May 1972 in the rubble of the Stock Exchange as the last walls came down.